FRESNO, Calif. (KFSN) — A first-of-its-kind facility aimed at helping people suffering from mental health issues opened in Southeast Fresno on Thursday. The new center will offer patients therapy while providing a secure residential environment. The Crisis Residential Treatment Center is a beautiful facility that cost about $5 million to build, with most of the money coming from state funding. “Hospitals are inundated with a lot of individuals that need mental health services so this is an added service. So instead of going to the hospital they can come here and we can stabilize them,” says Gerardo Cervanntes, an administrator at the facility. The 12,000 square foot facility has 16 beds and will provide psychiatric support and case management service around the clock. The goal here is to get residents used to daily household activities while learning coping skills necessary to successfully transition back into society. “By having this it increases the chance of success that someone who’s been in a mental health crisis can get the resource they need so they dont get into another mental health crisis,” says Utecht. Only clients with the greatest need and referred by the County Department of Behavioral Health will have access to this facility. “A facility like this creates a stepping stone that’s closer to the ones before and after so when a person is making that pathway toward recovery, it’s not a Grand Canyon they have to leap to get that recovery. It’s really a clear pathway and this is a really important stepping stone for us,” says Utecht. Administrators here expect to serve hundreds of people a year. And tell me they hope to expand their reach over the next few years by offering live in housing for clients. For several years in Visalia, employers told the Visalia Economic Development Corporation and the Tulare County Workforce Investment Board they had a problem. For Jorge Zegarra at the College of the Sequoias that was a clue to get to identify and refine trainings to meet the employer needs. The college offers an Essential Workplace Skills Training for employees of the manufacturing and logistic companies in the community. The training consists of eight sessions of three hours each and teaches basic skills like communications, problem solving, time management and critical thinking to name a few. The classes are either held at the Training Resource Center at the College or at a local employer. Another workplace challenge identified by employers is training people how to manage. “Often, you will promote a valued employee into a managerial position, and they don’t have any managerial experience,” said Bruce Nicotero, who runs the JoAnn Stores distribution center in the Visalia Industrial Park. The Frontline Supervisory Academy is a 36-hour course that covers 12 modules in three-hour increments in which new or existing managers learn tips about how to manage and motivate, the importance of teamwork, and how to manage change in today’s economy. “We have an open enrollment approach to support small businesses where they can send one or two of their employees,” said Zegarra, who said that a class would normally need from fifteen to twenty participants. In addition, the College of the Sequoias has partnered with a local employer in the city’s industrial park to offer an open enrollment electrical safety and industrial motor controls class that will begin this spring—as well as offering several food safety related trainings to help local employers comply with the Food Safety Modernization Act. The COS mission talks about being focused on student learning that leads to productive work, lifelong learning and community involvement. For Nicotero and other employers, there’s an appreciation for the work the college is doing not only to help employers today, but also to help build momentum for the South Valley Industrial Collaborative. “We’ve held two Industrial Summits and we are in the early stages of building the process which will attract more industry partners and hopefully even more cooperation with local community colleges to address the key issue of workforce preparation,” said Nicotero. The California Economic Summit—which will be held in Fresno this year (November 7-8)—brings together public, private and civic sector leaders to collaborate and adopt initiatives for fueling job creation and a stronger economy. The Summit—a collaboration of California Forward and the California Stewardship Network—has identified a strong workforce as critical to widely shared prosperity. 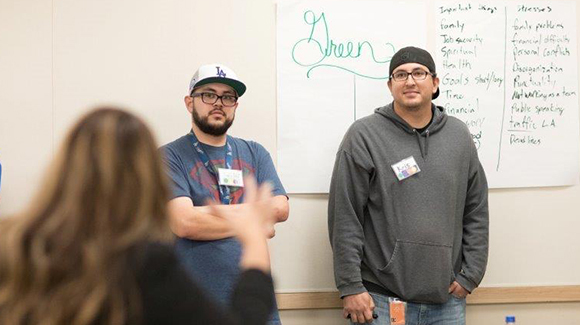 “It is exciting to see robust relationships developing between community colleges and employers in the Central Valley,” said Susan Lovenburg, director of the Partnership for Economic Prosperity for California Forward. “Their collaboration is crucial to building the workforce of the future. Bitwise Industries is teaming up with Fres-Yes realty company and expanding to a new location in Downtown Fresno. It will be located at the Old Spaghetti Factory building on Ventura and R Streets. The building will be the third location for Bitwise, which already has South Stadium Van Ness and The Hive. The second story of the new building, called “Bitwise 41,” will eventually have a team of 150 FresYes agents working there. Organizers say they hope the new location will inspire other businesses to come to Downtown Fresno. “So I think the exciting part as far as visibility goes you can’t get more visible than this building right here. 41 is directly behind me. North and south. 45,000 cars going each way. It is a prime location for just visibility alone,” said Channelle Charest with Bitwise. Bitwise 41 is expected to be ready to occupy in April. A grand opening will be held in early summer. TEJON RANCH, Calif.–(BUSINESS WIRE)–Feb. 14, 2019– Tejon Ranch Co. (NYSE: TRC) today announced that it has agreed to terms on a lease with a company that will relocate its western US distribution operations from the Los Angeles area to the Tejon Ranch Commerce Center (TRCC) in the fourth quarter of this year. The company, which wishes to remain anonymous for the time being due to competitive reasons, will occupy approximately 390,000 square feet of space in a new 580,000-square-foot building TRC is developing in partnership with Majestic Realty Co. The new building represents the third partnership between TRC and Majestic Realty. Construction has commenced, and the building will be ready for occupancy in approximately eight months. This newest tenant at TRCC imports goods for sale throughout the US and beyond and will therefore have opportunity to take advantage of TRCC’s status as a Foreign Trade Zone. All industrial sites within TRCC, totaling nearly 1,100 acres, are included in FTZ #276, which was re-established and expanded last year by the U.S. Department of Commerce in conjunction with Kern County. FTZ #276 is locally administered by the County of Kern and is one of the largest activated FTZs in California. The Tejon Ranch Commerce Center is Tejon Ranch Co.’s 1,450-acre master planned commercial/industrial development located at the junction of Interstate 5 and Highway 99 in Kern County, about an hour north of the Los Angeles basin. It’s entitled for more than 20 million square feet of commercial and industrial space, with about 15 million square feet still available. In addition to the previously mentioned L’Oréal USA, the Commerce Center is also home to major distribution centers for IKEA, Famous Footwear, Dollar General (NYSE: DG), Vision Media and Caterpillar Inc. (NYSE: CAT). Bellevue, Washington and Overland Park, Kansas – February 11, 2019 – T-Mobile US (NASDAQ: TMUS) and Sprint Corporation (NYSE: S) today announced that, pending the close of their merger, they have selected the Central Valley in California as the area for the third of five new Customer Experience Centers to serve New T-Mobile customers. The facility will create approximately 1,000 local jobs. As with the other previously announced locations in Kansas and New York, the new California facility, once integrated, will bring top-notch support to New T-Mobile customers. The state-of-the-art facilities will offer T-Mobile’s innovative Team of Experts (TEX) service model, which allows customers to have direct personal access to a dedicated team of specialists when they call or message for assistance. The specialists work with local retail and engineering to address a wide variety of topics and tackle complex challenges for customers. The five new TEX-enabled facilities are just one part of the future New T-Mobile’s plans to put customers first and bring jobs to communities. The companies also previously announced that two existing T-Mobile Customer Experience Centers will be expanding. These cumulative efforts will create up to 5,600 additional American jobs by 2021. The combined companies will have 7,500 more customer care professionals in 2024 than the stand-alone companies would have employed. “We needed to find just the right area for our next New T-Mobile Customer Experience Center – and we found it in the Golden State! California and the Central Valley have everything we need to take care of customers – amazing energy, a commitment to innovation and business, and most importantly skilled and diverse people who we can’t wait to join our team of Magenta heroes!” said T-Mobile US CEO and New T-Mobile CEO, John Legere. T-Mobile has consistently been featured on numerous “Best Place to Work” lists year over year. The newest Care team members will be eligible to receive benefits and opportunities such as significant management preparation experience, career development paths and college tuition reimbursement. The new Customer Experience Centers are just one way the New T-Mobile will invest billions of dollars in job creation and infrastructure in the United States. Sprint and T-Mobile together will employ more people in the U.S. than both companies would separately. Other investments include building out an industry-leading nationwide 5G network, delivering more competition and new choice to customers like broadband, and opening new stores to an expanding customer base. Valley Children’s Hospital officially opens its new Modesto medical center on Pelandale Road on Friday. The Specialty Care Center, a 40,000-square-foot, state-of-theart medical center, is expected to bring more pediatric specialists closer to families who need care. Valley Children’s will continue to provide expert care in several service lines, including pediatric cardiology, pediatric neurology, pediatric gastroenterology and pediatric orthopaedics. Pelandale Specialty Care Center will help Valley Children’s meet the needs of families in Stanislaus County and nearby communities, and keep them closer to home and to their own primary care physicians. to more than 27,500 within the next decade. Foster Farms on Thursday announced a multimillion-dollar capital investment project to support an expansion and upgrade of the company’s poultry processing facility in Livingston. The company that supports 2,032 jobs in Merced County will expand the facility’s product lines and add jobs, according to a news release. The announcement comes as the company is possibly in discussions to be sold to meat industry giant Tyson Foods, CNBC reported Tuesday. Foster Farms spokesperson Ira Brill would not say exactly how much the company planned to spend on the expansion, noting the firm is privately held. “Foster Farms is expanding its Livingston operation to allow for future growth and diversification of our customer mix on the West Coast,” CEO Laura Flanagan said in the news release. The expansion project is underway, the company said in the release, with completion scheduled for September. State and local leaders worked with the company to offer a $6.5 million economic incentive package. Foster Farms employs about 12,000 people at poultry plants in Livingston, Fresno, Turlock, Porterville, the Pacific Northwest and the South. Max and Verda Foster started the operation in 1939 and it remains under family ownership. “The city of Livingston prides itself for having such a dynamic and community-oriented company and we are pleased to see Foster Farms continue to grow and prosper here,” Livingston Mayor Gurpal Samra said in the release. Neither Tyson nor Foster Farms has confirmed the discussions of a possible sale, referring to the report as a rumor. The cable business network based its report on unnamed sources, who put the price at roughly $2 billion. The two sides disagree on the exact amount, and the deal could fall through, CNBC said. Foster Farms is one of the largest employers in the Northern San Joaquin Valley. Its hundreds of products include whole chickens and turkeys, fresh poultry parts, ground meat, deli slices, marinated products, frozen patties and corn dogs. The company has annual revenue of $2.4 billion, according to Forbes. The Modesto Bee contributed to this report. Paul Gross is vehement in stating his opinion on magic. “There is no such thing as real magic. I can’t make you disappear for real,” the 63-year-old said. That may seem an odd stance, considering the Fresno resident founded and owns Hocus Pocus, among the most prolific online vendors of magic tricks, props and paraphernalia in the country, selling everything from trick playing cards and how-to books to the various swords, escape boxes, restraints and other items used by amateurs to professional magicians. What Gross doesn’t believe in is actual magic — love potions, spells, totems, the occult, etc. — that some people mistakenly believe his business can supply. Gross’ stock in trade is illusion, in which the seemingly impossible is done through sleight of hand, mirrors, diversions and hidden compartments that all are explainable, if you know how the tricks work. Gross believes in that sort of magic strongly, so much so that he has dedicated most of his life to it, first as an amateur turned professional illusionist by his teen years, then going into in the retail side of magic, initially opening a magic shop in Fresno in his late teens and a couple of decades later converting to a mail-order business and then to an online vendor of supplies, props and memorabilia with sales last year totaling about $3 million. “If it wasn’t for the Internet, this business wouldn’t be where it is,” Gross said, noting that the vast number of YouTube postings and other online sources teaching people how to perform illusions has magnified the public’s interest in buying magic supplies and to see magicians perform, both of which benefit Hocus Pocus. Even the larger space in a nondescript Fresno industrial building barely has room to contain all of the items for sale. The back portion of the building is a veritable museum to illusions, because besides selling new supplies and books, magicians, their families and their heirs often sell their old props and supplies to Hocus Pocus or consign the business to sell the items for them. Need a guillotine or a basket to impale with swords after an assistant shimmies inside of a mock mummy’s tomb or a strait jacket or a big wooden box and saw for sawing a lady in half? Hocus Pocus might have one or more any given week and be able to pack and ship it to you. Hollywood is a frequent customer, with studios often buying thousands of dollars worth of props and other magic-related goods to use in movies and television shows. Gross’ magician clientele has included Mark Wilson — a staple of 1960s and 1970s television — Criss Angel and Shin Lim, last year’s America’s Got Talent television show winner. Hocus Pocus also sells the magic supplies Lim endorses. “He did three tricks, which I still remember to this day — got my grandfather up to help him [with one], and that was it. I got bit,” Gross recalled. Back then, there were no magic shops in Fresno, so Gross ordered tricks and instructions on performing illusions via mail-order catalogues and later via trips with his parents to a San Francesco magic shop. “I bought every single trick until I opened my own business,” said Gross, who got skilled enough that between the ages of 12 and 18 he worked paid gigs as a magician between school and working at the furniture store his father ran. After high school, his father co-signed a $2,500 loan for him to open a magic, gag and novelty shop in 1973 in southeast Fresno, and while it did well, Gross closed it 15 years later because he had to take over running the furniture store his father had opened after he fell ill to cancer. Nine months later, Gross said, he reopened the magic shop in Clovis, “and we ended up getting out of the furniture business, because it wasn’t my cup of tea,” after four years of running it. In the years that followed, Gross changed locations and his business model, converting from a walk-in magic and novelty store to adding a side venture as a mail-order magic supplier in the late 1990s. But that changed in 1999 after a friend introduced Gross to his first home computer, and he decided that online ordering and offering an online catalog bigger than what any other magic and novelty suppliers were offering on the Web was the way to go. Business since then has been good, so much so that Gross stopped operating a walk-in store to sell just online. But Gross never forgot his brick-and-mortar roots. With no other magic shops in the Fresno area, people often walk into Hocus Pocus looking for tricks or advice from Gross or his son and partner, Max Gross, 26, who has never performed magic professionally but is skilled in many of the tricks the family business sells. The two also spend a lot of time speaking with customers calling in for advice, “But they don’t always listen to me,” the senior Gross noted. Visalia has the most affordable homes in the state, according to a new study. HomeArea.com looked at 142 California cities with a population of 60,000 or more, calculating what’s called the “median multiple” for each one. The median multiple is the ratio of the median house price by the median gross household income. Other Valley cities in the top 10 include Clovis and Bakersfield. At the very bottom? The City of Newport Beach, whose median multiple is nearly three times higher than Visalia’s. MERCED ­- California Central Valley Economic Development Corporation (CCVEDC) announced today it will receive a $50,000 contract with the Central California Workforce Collaborative (CCWC) in a collaborative effort to boost effectiveness in serving employers. The business engagement program will use existing economic development networks to deliver information on workforce programs, tax incentives and other resources that can maximize the competitiveness of businesses and the productivity of the local workforce and increase regional economic prosperity. CCWC is comprised of eight (-8-) local Workforce Development Boards representing ten (-10-) counties of Fresno, Inyo, Kern, Kings, Madera, Merced, Mono, San Joaquin, Stanislaus, and Tulare. CCVEDC is a not-for-profit Corporation supported by the 8-county region in the Central Valley, PG&E and Central Calif/Central Mother Lode Regional Consortium (CRC) Partnership, whose mission is to attract and retain jobs and investment in the Central San Joaquin Valley counties of San Joaquin, Stanislaus, Merced, Madera, Fresno, Kings, Tulare and Kern. For more information, www.centralcalifornia.org.